The digital opportunity in the packaging sector of the printed graphics market is valued at over $10 billion, and with projected growth rates of 14% to 2020, this sector is booming. To keep up, equipment, software, and ink manufacturers are creating innovative tools, unique packaging specific solutions, and chemistry to enable future growth in digital packaging. Digital print’s potential is enormous and already proven to be disruptive in other print segments. Industry leaders are supporting this trend and are pushing their return on investment ever upwards. The beauty of digital is its innovation and power is not exclusive to technology. Digital focuses on harnessing technological prowess with any organisation able to embrace evolution and development as part of its operations. While digital is already widely accepted in the tag and label sector and the short run pharmaceutical folding carton sectors, of the packaging segment, other segments are ripe for significantly digital adoption in the next three to five years. Particularly, the packaging sectors of corrugated, narrow web flexible film, and direct to shape (metal and plastic containers) offers the next likely high growth areas for digital. The digital evolution continues to offer improved usability. As a result, the importance of a consumer’s experience continues to increase. As consumers’ confidence in digital transformation has grown, they have aligned themselves with brands and products that cater to their ever-evolving needs. While the initial driver for digital was to enable personalisation, on the fly customisation, short run profitability, and the enabling of quicker and easier design to print campaigns are driving the next growth spurt. Consumer’s expectations for packaging in the digital bombardment age, is also changing, just as the way millennials see and respond to advertising is changing. Why is digital print continuing to grow? 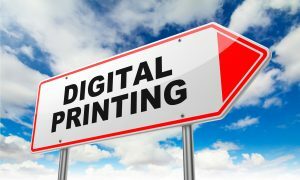 In addition to the reasons outlined above, the growth of digital print enables print providers to exponentially improve and increase the services they offer to their customers. In addition, digital empowers innovation and encourages an increase in revenue streams not easily achieved in traditional print methods. It’s expected that digital print will make the most of the high value short runs and provide quicker turnaround times for packaging sectors. Today, there are both electrophotographic (dry and liquid toner) technologies and inkjet ink types of digital. Toner based systems, such as Indigo, Xerox I-Gen, and Xeikon, have gained an early foothold on the short run tag and label, as well as some folding carton sectors. More recently, inkjet solutions are being adopted as they can often do more than electrophotographic systems at a lower cost of ownership. The technology advancements in the inkjet print head, electronics, and ink chemistry has now reached a point of practicality, likely eclipsing electrophotography as early as 2019. Beyond toner and inkjet are a number of what have to still be referenced as “yet-to-be-proven” digital technologies that, if they really work, will also be very disruptive in the packaging sectors, especially those food related packaging sectors. Excitingly, the greatest changes expected over the next decade will be in packaging. Sectors that are most likely to employ digital production processes include corrugated (direct to board and pre-print liner), metal decoration (2-Piece, and flat sheet 3-Piece), flexible (films, bags, pouches, etc. ), and rigid (direct to container) applications. The folding carton sector also has the potential to grow as digital technologies develop further. Digital continues to break new ground in all kinds of industrial applications, forging applications including flat and round glass, textiles, ceramics, tiles, wood, plastic composites, electronics, and 3D. The term “Industrial Digital Printing’ has come to represent a kind of catch-all descriptions for every type of decoration that does not already fit into a known segment or sector. Organisations which recognize the phenomenal growth and potential of digital packaging are often engaging strategic alliances or in joint ventures, sometimes for technology, sometimes for route to market. This approach enables companies to capitalise on a booming market with less risk and faster time to market. These types of partnerships often bring together technology components and brands, as well as system manufacturing and customer facing solutions to help drive the industry faster into the digital age. Some examples include companies such as: Xerox with Impika, Fujifilm working with Heidelberg, and Xerox( Primefire 106), KBA with their own subsidiary Kamman (Direct To Shape) and new projects with Landa (S10 automation) and Xerox, Komori and Landa (Impremia NS40). Flint Group have acquired the Xeikon business in a key strategic move. On-demand printing reduces waste and also means the latest design, product information or alterations to components do not create unnecessary clutter such as superfluous records. Electrophotography and inkjet’s continual evolution and development mean that on-demand printing is possible for the packaging industry. Specialised detail such as packaging specific to a particular region, demographic or specific interest is now a practical reality for the packaging sector. Exactly where in the supply chain that the printing is happening is also changing with Digital evolution. Digital printing near or actually in-line with the packaging converting process is also a trend, further shortening the turn-around time for a package to market while offering the flexibility only digital can offer. There’s no doubt about it. The inclusive effects of digital development, particularly on the consumer, has changed the way in which the market interacts with packaging. Everyone wants to jump aboard this rapidly expanding sector, flourishing beneath digital technology’s ingenious gaze.